Note: This update covers the period from 3/29/04 through 4/4/04. The front gyro lights are on!! And, they work. The correct front headlight housing did not manage to find its way on because of a painting issue. 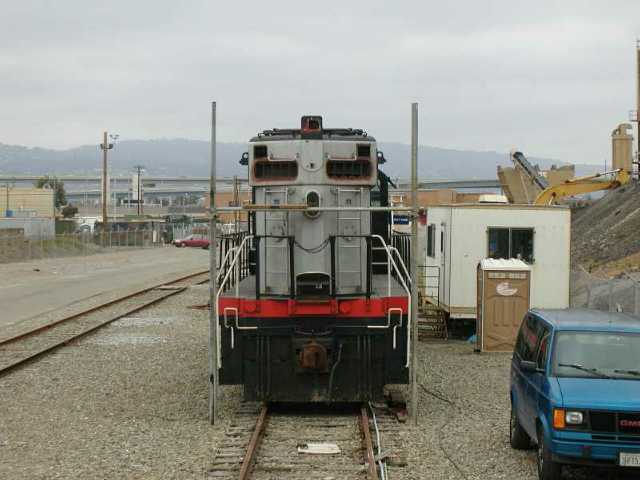 It seems that the original type housing is about 1 inch shorter than the existing one so if I were to put it on, old rusty paint would show around the housing. So, I am electing to put off installation until the front end is repainted. 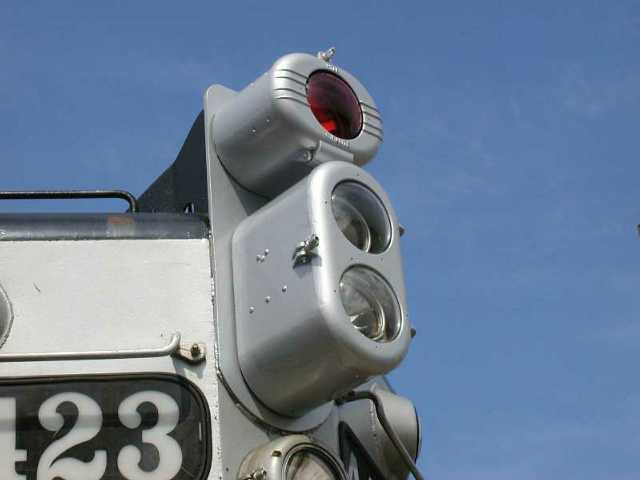 While looking at the existing headlight housing, I realized that there are no mounting holes for the original one. 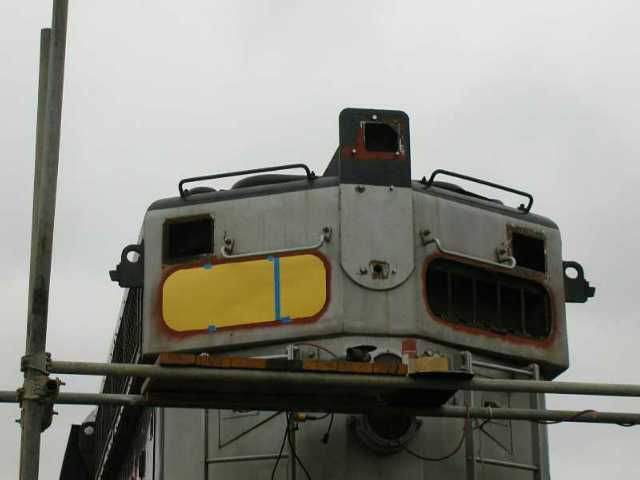 Upon further checking, I noticed that there is a weld line up the front indicating that the left half and center of the nose has been replaced which explains the lack of the holes. 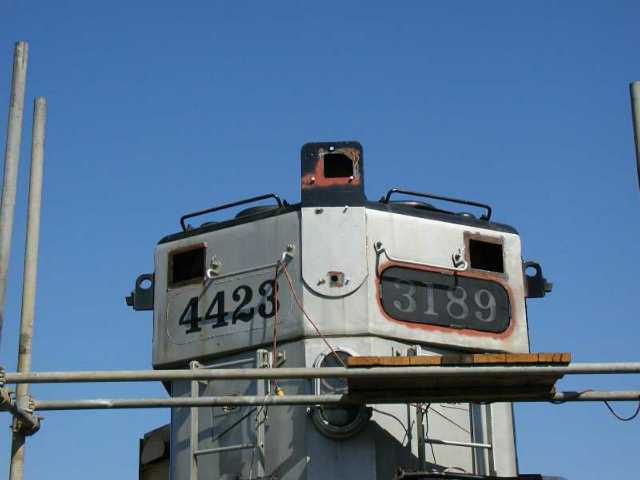 Do you suppose that the 4423 was wrecked at some time or was this done because of rust damage? I would bet that the housing was changed at that time too. 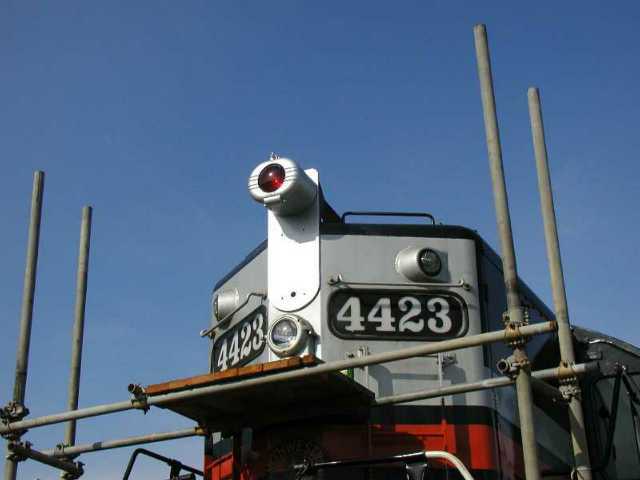 Except for the number boards, headlight housing and paint, this completes the cosmetic work on the nose of the locomotive. The front number boards are being left for a while because the metal strips which separate the individual numbers behind the glass have been cut out and I need to see the strips in the rear in order to make replacements. 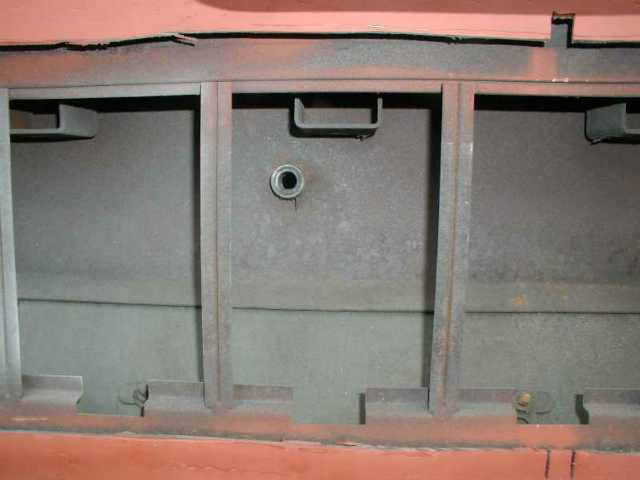 The strips in the rear are intact but covered by the metal plates welded in by the SP. This whole business will become more clear when I remove the plates from the rear number boards. After the front gyro work was done, I moved the scaffold around to the rear end so work can start there. There are 3 major jobs to do to the rear end. First of course, are the Gyralights. 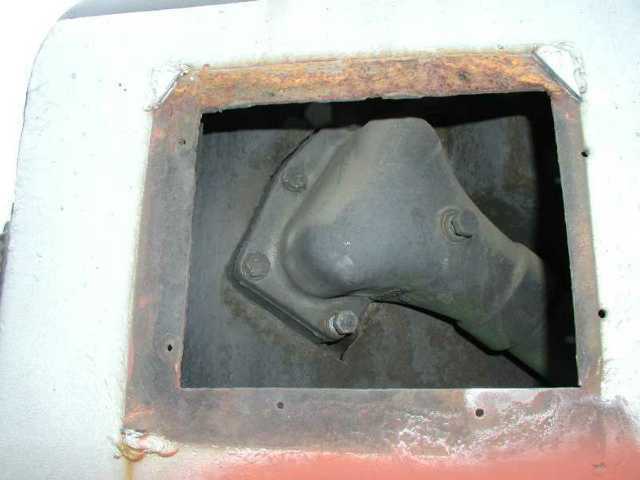 As in the front, all the mounting bolt holes were either filled with broken bolts or weld. And, as in the front, all the holes were driled out and tapped. The lights were test fitted and the only thing to be done now is the wiring. Next, I decided to tackle the rear number boards. 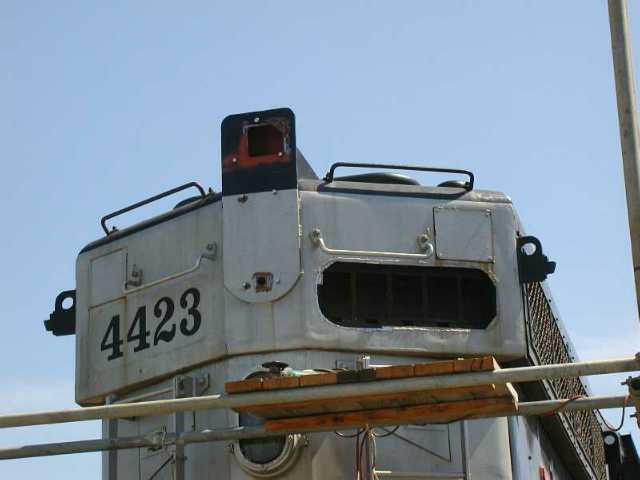 When I did the rear boards on the 5623, they had metal plates welded over the holes. 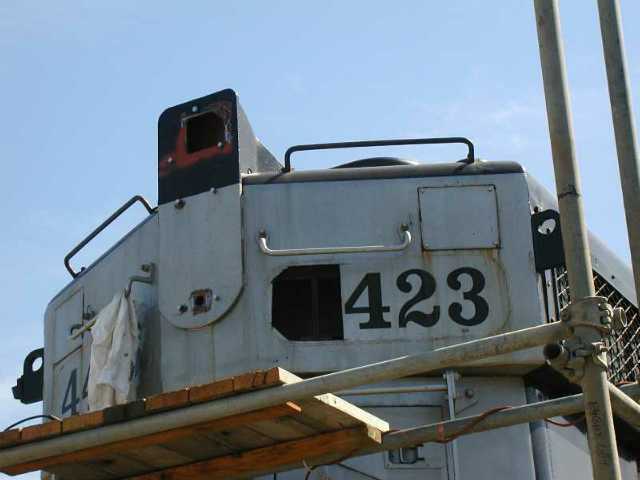 The 4423 has the plates welded in the opening. This made it particularly difficult to cut the plates out as there was often no clear demarcation of the hole outline due to the weld joint. The right hand rear board took a bit over 5 hours to open up. I tried one of the old 3189 number boards in the hole and it seemed to fit just fine. The left hand board opening was even more difficult as the plate was so perfectly welded in that the old opening line was just impossible to find. I made a paper template and used it to establish the opening and then cut it out. This only took 4 hours. 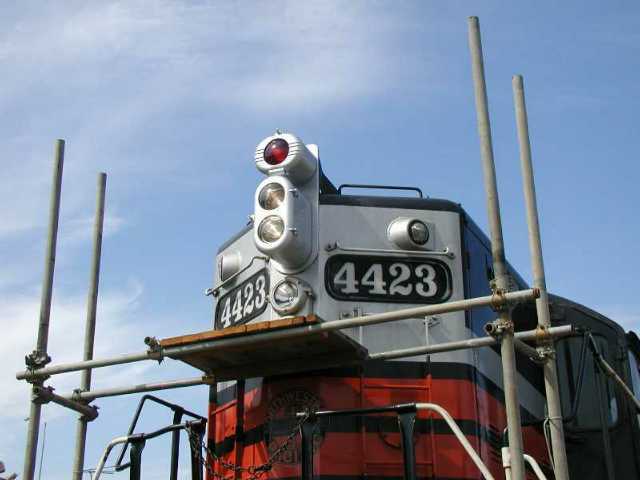 Right now, the 4423 looks like some sort of eyeless monster from a grade B science fiction movie. The inside of the number boxs are complete but very rusty and without light sockets and wiring. Once again, my parts bin will provide the proper sockets. I often wondered why I collected all this stuff. Now I know. I opened up up the holes where the class lights would go just to have a look and discovered that they provide access to the front radiator header pipe bolts. 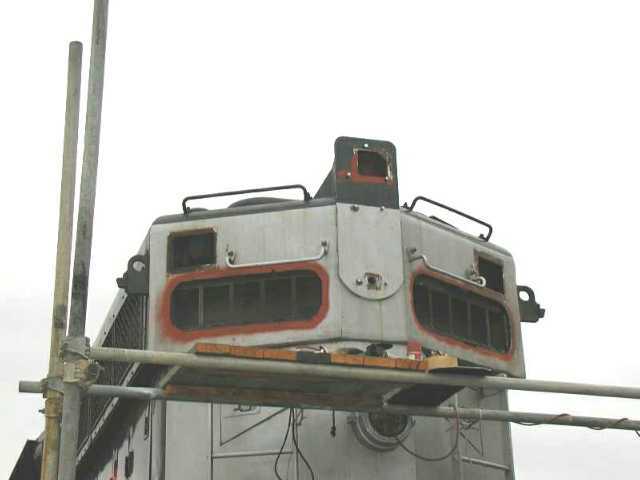 I originally thought that we would get access when the hatch came out but that turned out to be untrue. Now, all of the radiator connection bolts are out and awaiting a crane.